Launched earlier this month by Tanjong Golden Village (TGV) Cinemas, MovieClub is a loyalty reward programme to improve and enchance the movie-going experience for its frequent patrons. Like most loyalty programme cards, members can earn and accumulate MovieMoney each time they spend at TGV Cinemas. MovieMoney can be used to pay for future items such as movie tickets, candy bar items, food and drinks from our F&B outlets – Chill*X, INDULGE and Vie Café. 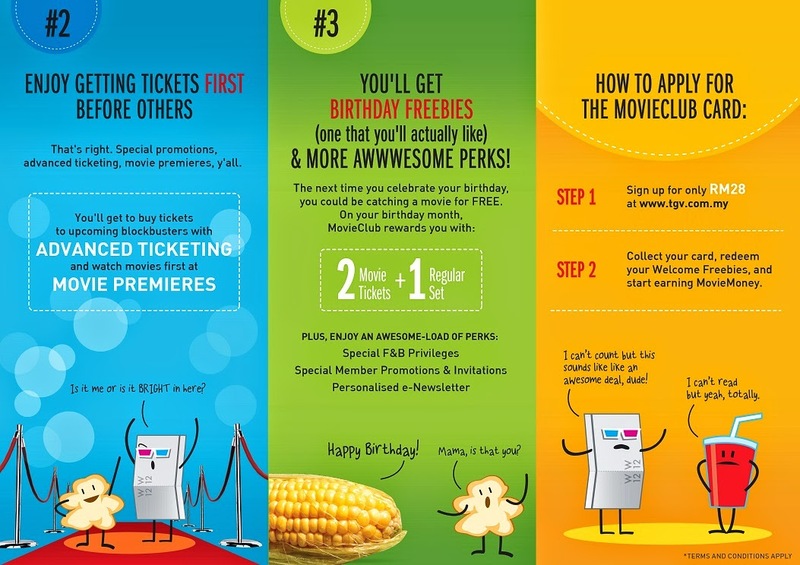 It doesn’t seem that there’s permanent ticket discount, something that a frequent moviegoer like myself would definitely appreciate, but the Welcome and Birthday Freebies alone are already worth more than double of the membership fee. Still not impressed? Well according to CEO of TGV Cinemas Gerald V. Dibbayawan, this is just the tip of the iceberg and loyal customers are encouraged to sign up to find out what else is in store. In conjunction with the launch of the TGV Cinemas MovieClub programme, cinema-goers who sign up now either via online or any TGV Cinemas location will also receive an exclusive MovieClub limited edition premium (while stocks last). Not idea what that is but for more info, please log on to www.tgv.com.my.